﻿﻿ I had another incredible dream. Before the dream David and I embarked on our vacation cruise to Belize and Cozumel. Unfortunately, we did not realize that we were traveling during Spring College Break. 1800 rowdy, horny college students accompanied us on our cruise. Yesterday evening, first night of the cruise, a group of male college students right next door to us, kept me awake with their loud swearing, drunken behavior and inconsideration for their fellow passengers. “I was preparing to go swimming in the ocean outside the ship with another woman. I looked up and saw two enormous portholes on both sides of the ship. Suddenly a gigantic dolphin leaped through one porthole and out the opposite porthole plunging back into the sea. A few people who were swimming outside also fell through the porthole and onto the deck, I hoped that they were not injured. As I gazed upward at this strange spectacle I saw a mammoth Hindu God peering through the port hole. He had long shoulder length hair and his face was narrow and kind of long. His complexion was like a brown seaweed hue with greenish blue tones. There was a brass colored crown on His divine head. His body was strong, powerful and muscular. He wasn't angry but he did have a serious expression on His face – like He was checking up on us, investigating. Then the dream began to fade and I woke up. This dream was so intense, the energy and strange beauty clung to me throughout the cruise. 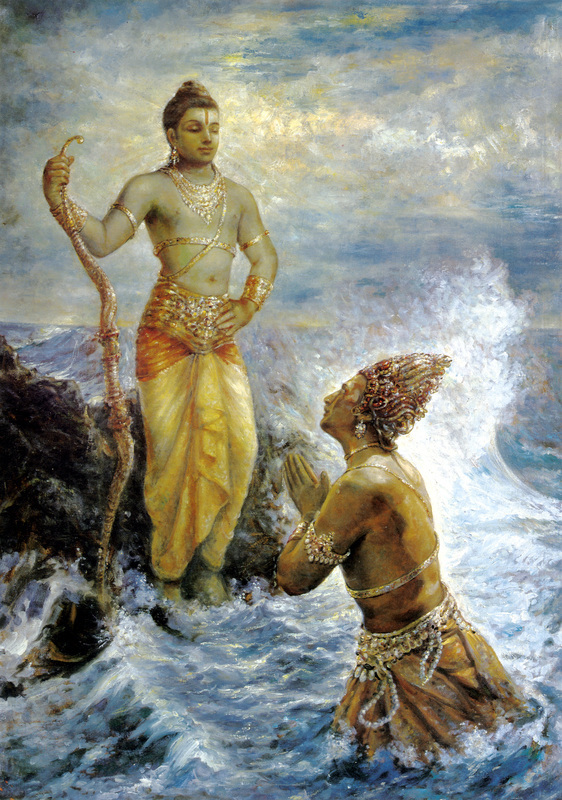 The word Varuna kept popping into my head, so when I arrived home today I googled Hindu Sea god and Varuna came up. When I saw the image it was remarkably like what I had witnessed in the dream, only He had hair to His shoulders. There are worlds and Gods of astounding splendor and power whirling unseen all around us. Om, Om, Om.